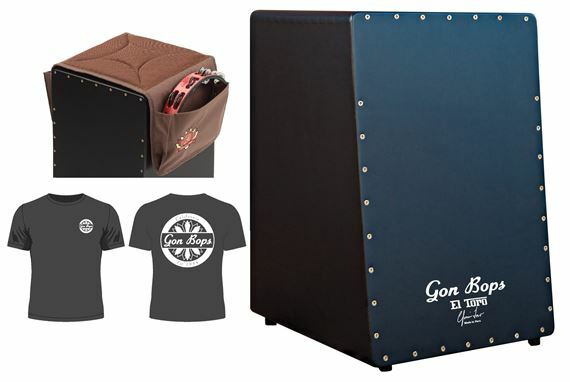 Shop Gon Bops El Toro Snare Cajon With Carry Bag CJSPAD from AMS with 0% Interest Payment Plans and Free Shipping. The beautiful sounding Gon Bops El Toro Snare Cajon is named for the highly-acclaimed percussionist Efrain Toro. Handcrafted from select indigenous hardwood for studio-quality sound and optimal playability, the El Toro Cajon features inner guitar strings for authentic Flamenco Cajon tone. The El Toro Snare Cajon delivers an astonishing range of tone, from snappy highs to deep, resonant lows, partly due to its angled front contour. Large rubber feet ensure ample bass tones don't get lost in the floor. The hand-made El Toro Cajon looks and sounds simply stunning and is built to last. Free carrying bag included. Provides a comfortable, non-slip seat with pockets for your brushes, mallets, smaller hand percussion instruments and electronics or mobile device. Also offers protection from scratches or dings for your cajon.